Whether it’s road cycling, mountain biking or just the daily commute, that passion for travelling on two wheels gets us through the occasional low moments in the wet and the cold of winter. When Fred, a fourteen-year-old from Brighton, wrote to us about his passion for mountain biking, his piece struck a chord in us. His thrill-seeking ups and downs on the South Downs and trails of Stanmer Park brought back that magical childhood moment of falling in love with the bike. Whizzing down a hill on my ‘running-bike’ along with my friend. Trying to stay on it but also beating him at the same time. Using my feet as brakes, I had to haul myself to a stop. This was the thrill-seeking experience that got me into cycling. I couldn’t imagine myself without a bike now. My name is Fred and I’m a dedicated mountain biker with a Boardman hardtail. And I’ve been cycling for as long as I can remember. My first proper bike was a light blue Dawes with a small range of grip-shift gears and not much suspension. But that was enough to get me into mountain biking at the time. I had it for quite a while until I moved on to road biking. My first ever road bike was a 24” Isla Luath. The shiny red on its glossy frame was the thing I cherished most. I did road cycling for about a year until I started to get bored of the repetitiveness of the black tarmac. My glossy red Isla hung from my wall untouched for a long time and started to gather dust. I remember my dad describing it as “the most expensive piece of wall furniture I’ll ever own.” I soon after sold it and stopped road cycling. My first big mountain bike ride was an attempt at cycling the South Downs Way. It’s a 100-mile cross country ride from Winchester to Eastbourne. I set off with my dad, my brother, and my sister. My dad was on this rusty, ancient old Trek which he has had for years. My sister was on her blue hybrid which she had just got brand new. I was on an awful hand-me-down red mountain bike which I found hard to get to grips with. My brother was on my old blue Dawes. We wouldn’t get very far in a day since I was seven, my brother was six, and my sister was nine. Due to my dad’s bad map reading skills, he managed to get us lost quite a lot and took us the hard way. After a day’s riding we would stop at a dingy, cold youth hostel which was one of the most horrible places I had ever stayed in. On a regular basis we would have literal and emotional ups and downs. One of the most memorable strops we had was when my sister decided she didn’t want to go on anymore. She stopped and sat down right next to a pigsty. The foul smell was horrible but after a lot of persuasion and bribery we managed to get her back up and going. After another exhausting day’s riding we came to a B&B where we settled for the night. The next day was the most miserable and the last day of the ride. It was a combination of tiredness and cold, wet rain which made us decide to stop and leave the ride unfinished. It must have been a year or so without cycling before my friend Archie started properly getting into mountain biking. He taught me a lot and I started to read about the bikes online. 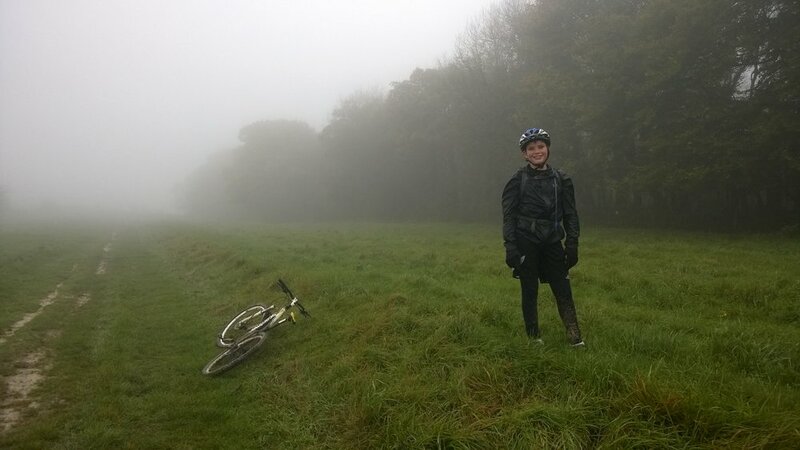 A few months had gone by and I was now really into the idea of mountain biking again, so I started to go on rides while my dad went running with the dog up at Stanmer Park. I was now riding my sister’s old blue hybrid, the one she’d dumped by the pigsty, but I found it very hard to ride because of mechanical issues. The search for the new bike had begun. Archie and I spent mindless and endless days on ebay searching for a good, reasonably priced bike. At this time, it was coming up to my 12th birthday and it was just a case of seeing if we could win the final bid on a bike that either Archie or I had found. I remember Archie knocking on my door telling me he had found a good one in my size for only £250. I was very excited when my mum and dad said that they had contacted the owner and had arranged to buy it. The bike was now on its way to Brighton and I couldn’t’ve been happier or more excited. Coming home from school I arrived at my door and rung the doorbell hoping and praying that my bike had come. I walked into my room and there it was, a big brown box staring right at me. I couldn’t help but start to rip it open. I started to get a glimpse of the shiny black Boardman frame, which I had waited for for so long. This was my first bike with hydraulic disc brakes and at the time I didn’t know that if you pressed down the brake lever without the disc in, the brake pads wouldn’t re-open. The first mistake had been made and resulted in us having to go down to the bike shop to not only get them re-opened but to also get a new disc-rotor because the one that came on my bike was bent and was rubbing against the brake pads. Despite the minor issues, the bike was great and all I had to do now was ride it. Stanmer park was the first ride on my new Boardman. I thought this would be a good place to ride it because the trails are for all abilities, and I knew this place like the back of my hand. Finally, we got there. After all the uphill I was thirsty and out of breath. I was with Archie and my dad, Archie had recently got a Boardman as well off his cousin, and my dad STILL had his ancient and even more rusty Trek. Despite the bad weather, I still had a great time. The trails we did were the ones that Archie had done before so he could tell us what to expect. Although the bike felt pretty big on me, I managed to adjust. One of the things that I was most excited about was having suspension; on all my old bikes, although it looked like they had suspension, they were fully rigid bikes. Stanmer Park is a great place to ride and one of the perks is the café at the bottom which we have to stop at on every ride. The chips and hot chocolate give you the fuel to ride back up to the top of the hill. This is how the mountain bike madness began.